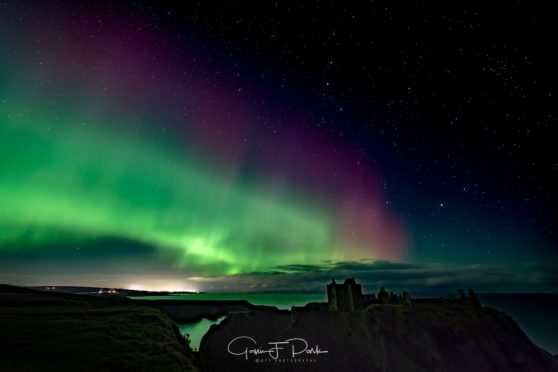 Aberdeenshire and the Highlands may be among the best places in Scotland to see an extraordinary display of the Northern Lights this weekend. A solar storm on its way to Earth could mean they might be seen from the UK on Saturday night, forecasters have said. And the Met Office believes the phenomenon, known as the aurora borealis, may be most visible in northern parts of Scotland. Bonnie Diamond, meteorologist at the Met Office, said: “A Coronal Mass Ejection has happened and the effects of that are expected to arrive later tomorrow evening. “This type of active geomagnetic storm means that there is the possibility of the aurora borealis, commonly known as the Northern Lights. “Whether or not you will see the Northern Lights depends on where you are and what the weather is like. Scotland is where you’re most likely to see it. “There’s a couple of showers on the west coast of Scotland on Saturday evening, and with those showers there will be a bit of cloud. The Met Office’s Space account tweeted: “CME forecast to arrive late March 23 following C5 flare from sunspot AR2736. Active-minor geomagnetic storm periods possible with low risk of moderate storms.